The Kennedy Center Presents: The 2005 Mark Twain Prize celebrating Steve Martin premiered Wednesday, November 9, 2005 at 9:00 p.m. on PBS stations nationwide. Taped at The John F. Kennedy Center for the Performing Arts on October 23, 2005, the two-hour special features tributes and comic performances from an all-star cast of Martin's friends and colleagues including Dave Barry, Claire Danes, Larry David, Tom Hanks, Eric Idle, Diane Keaton, Queen Latifah, Randy Newman, Martin Short and Paul Simon. Former Mark Twain Prize recipients Carl Reiner, Lily Tomlin and Lorne Michaels were also in attendance. 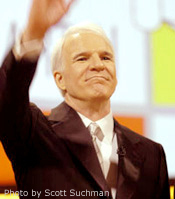 Steve Martin is the eighth recipient of The Kennedy Center Mark Twain Prize for American Humor. Major funding for The Kennedy Center Presents: The 2005 Mark Twain Prize is provided by the Corporation for Public Broadcasting and the Public Broadcasting Service. Corporate funding is provided by T. Rowe Price Investment Services. Additional funding is provided by United Technologies and the Mark Twain House. "Mark Twain Prize" TM/© Chase Manhattan Bank and Richard A. Watson as trustees of The Mark Twain Foundation Trust under license authorized by CMG Worldwide Inc., Indianapolis, Indiana, 46256 USA. A co-production of WETA Washington, D.C.; The John F. Kennedy Center for the Performing Arts; Mark Krantz Productions; and Comedia.